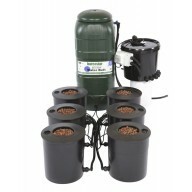 Deep water culture is a method of growing which leaves your plant’s root submerged in an oxygenated nutrient solution. 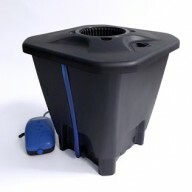 The IWS DWC oxygenated pot is one of the simplest and best value routes into hydroponics available. The container is filled with a nutrient solution which is continuously oxygenated by an air pump. 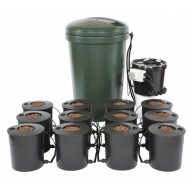 The pots are not connected which means that each capsule works independently from any others, meaning that each pot must be maintained individually. The hanging gardens of Babylon are one of the oldest examples, as are the vegetable gardens of the Peruvian peoples cultivated on the surface of high mountain lakes like the Titicaca. The Aztecs, meanwhile, settled in the swamps near the future city of Mexico and gardened on rafts of sorts, leaving the roots of plants in the lakes: unknowingly, they were the precursors of a species primitive aquaculture. The Chinese still use ancestral techniques of gravel cultivation. The above-ground culture that we know today was born in the nineteenth century in Germany; discovered as part of the research carried out to find out what was feeding plants. It was not until 1930 that Gericke produced the first commercial hydroponic system in the United States. During the Second World War, Americans cultivated hydroponic vegetables in the Pacific volcanic islands to provide the vitamin needed for the good health of their troops. Since then, tests have proven the viability of the technique, as well as its economic and environmental potential. Today, above-ground cultivation is practised on millions of hectares in the world. A lot of fresh vegetables like tomato, cucumbers, zucchini, lettuce, peppers, spinach, beans, carrots, potatoes and aromatic herbs, which are grown in the greenhouse, are produced above ground, and this is also the case of the majority of cut flowers found in florists. IWS DWC 1 site Deep Water Culture (DWC) is a method of hydroponic growing in which you submerge the roots of your plants in a highly oxygenated nutrient solution to help facilitate growth. Your plant is suspended in a net pot above your nutrient solution, allowing the roots to soak. An air pump o..
Oxypot-XL-System How Oxpot hydroponic systems work The Oxypot mesh pots hang down into their misting chamber and an air pump constantly oxygenates the solution creating a stream of bubbles and an oxygen rich environment. 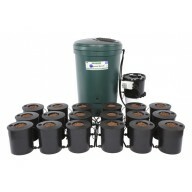 The roots have constant access to nutrient solution and oxygen which l..
IWS DWC 6 SITE SYSTEM 6 Pot Kit Deep water culture is a method of growing that leaves your root submerged in a highly oxygenated nutrient solution which causes rapid growth, IWS have taken an old classic and brought it up to todays growing technology standards. 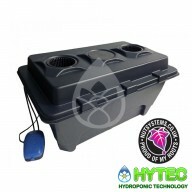 The IWS DWC systems, just as the..
IWS DWC 12 site system Deep water culture is a method of growing that leaves your root submerged in a highly oxygenated nutrient solution which causes rapid growth, IWS have taken an old classic and brought it up to todays growing technology standards. 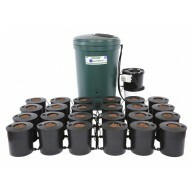 The IWS DWC systems, just as the origina..
IWS DWC 18 site system Deep water culture is a method of growing that leaves your root submerged in a highly oxygenated nutrient solution which causes rapid growth, IWS have taken an old classic and brought it up to todays growing technology standards. The IWS DWC systems, just as th..
IWS DWC 24 site system Deep water culture is a method of growing that leaves your root submerged in a highly oxygenated nutrient solution which causes rapid growth, IWS have taken an old classic and brought it up to todays growing technology standards. The IWS DWC systems, just as th..